Quinoa Chard Frittata with Balsamic Onions | Naturally. I know most people obsess over the holiday dinners. There are schedules and multi-day prep routines. Depending on your personality, it can feel energizing or it can feel completely overwhelming. So what happens when you also have to think about having guest stay over, which includes feeding them breakfast? It can feel like ‘one more thing.’ But luckily, there are some solid breakfast recipes that everyone can enjoy. 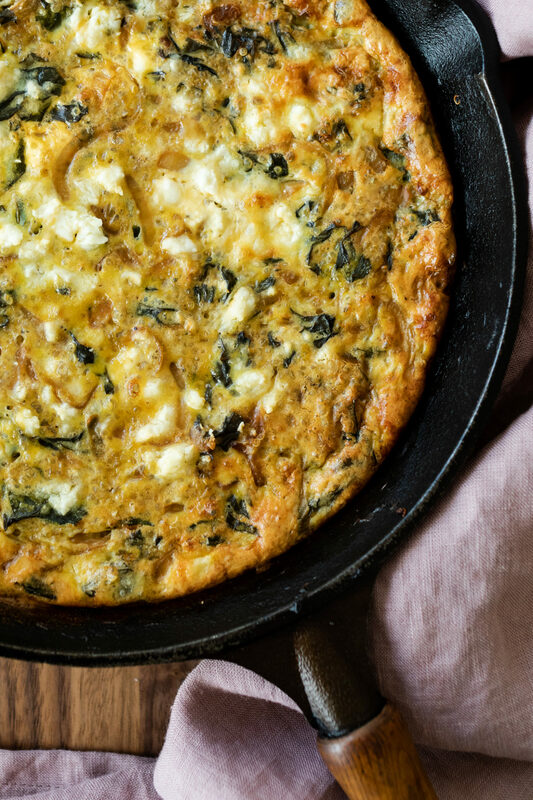 For starters, wow them with a beautiful chard frittata! One of the biggest pushes for sharing this recipe is to chat about chard. Whenever I ask people what one thing they wish they cooked more with, I get an overwhelming amount of ‘chard’ as the answer. It can be a tough green to like but it’s one of those ‘get to know’ type items. Meaning, once you get to know it, you become good friends. To get you started, I’ll let you in on my relationship with this greenage. I like chard just barely-cooked OR completely cooked, beyond recognition. Chard, when cooked to an in-between stage, has an unappealing, almost slimy texture. It’s just not my thing. And so, for this chard frittata, I cook the greens well. Beyond well, really. It melts into the onions and it’s the perfect companion for the quinoa and feta. I love the flavor of caramelized onions but I’m in the camp that you can’t have true caramelized onions without a solid amount of time. Anything labeled as such but only tells you to cook onions for 20 minutes is just wrong. You need the gift of time to really get that perfect, sweet flavor. However, I have a cheat and it’s perfect for when I want flavorful onions in less than 20 minutes. I cook the onions until soft and add a splash of balsamic vinegar. It’s definitely not the same flavor but cooking the onions a bit longer in the vinegar allows the vinegar to reduce and become a bit sweeter, helping the onions out. You could always use pre-cooked caramelized onions (if you’re into batch/prep cooking). You could also just use regular cooked onions or shallots (equally as nice in this recipe). Grains aren’t a normal frittata addition for most but they are almost a necessity in my kitchen. I don’t like an overly-eggy frittata. It’s why I don’t use a ton of milk in the base (in fact, you’ll see I use cream instead of milk too). Using grains really helps balance the egg to extra ratio. 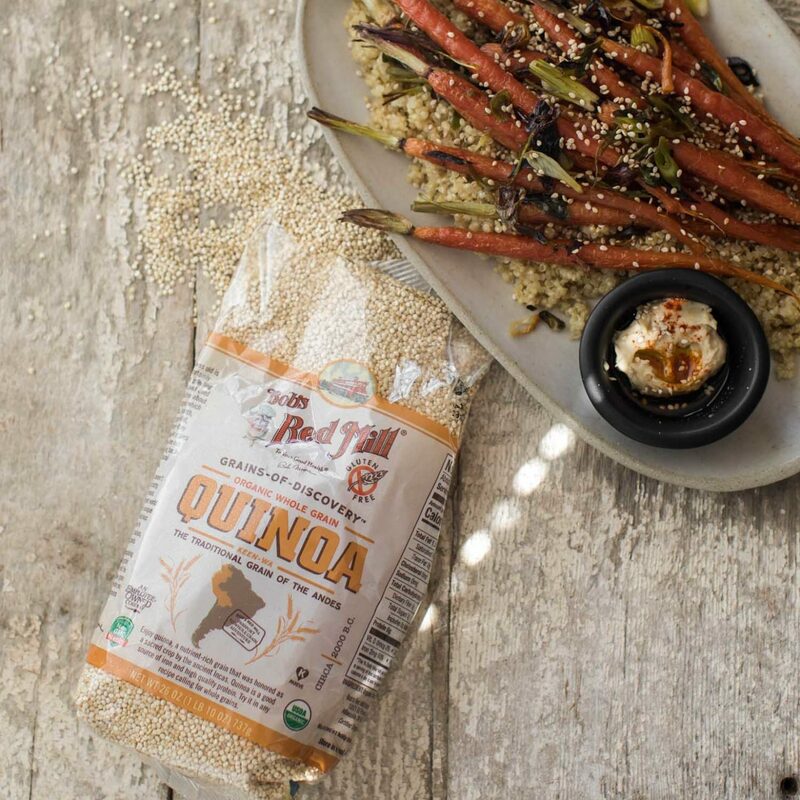 So why Bob’s Red Mill Quinoa? It’s my dependable, quick-cooking grain. It cooks in the amount of time it takes to make the onions. 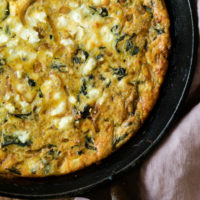 But really, more often than not, I already have a batch cooked in my refrigerator making this chard frittata even easier. 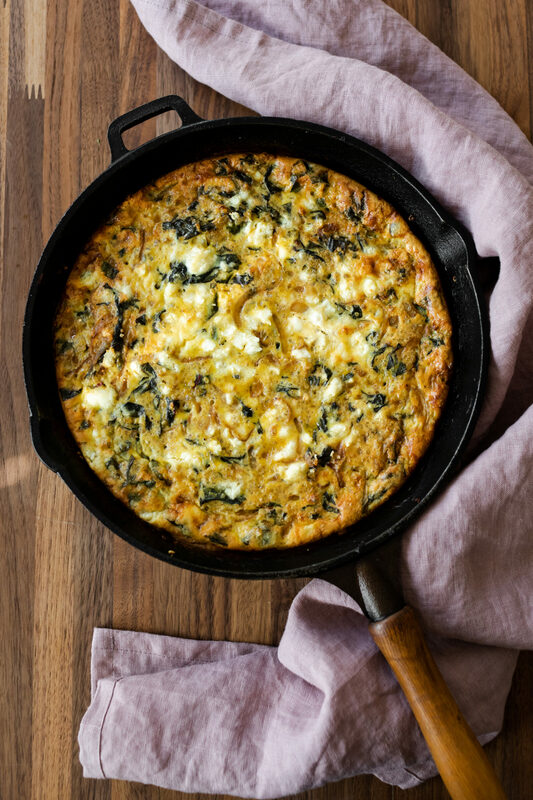 Whether you’re looking for a solid weekend breakfast or a meal that can feed your holiday house guest, a frittata is the perfect go-to. It can easily be adapted to use whatever you have on hand including herbs, vegetables, grains, and plenty of cheese. Combine quinoa, vegetable broth, and salt in a small saucepan. Bring to a boil, reduce to a simmer, cover, and cook for 12 to 13 minutes. After that time, remove the pan from the heat and let steam until ready to use. Alternatively, use about 1 cup leftover quinoa if you have that available. To make onions, cut into ⅛” thick half circles. Heat over low the olive oil in a skillet. Place sliced onions in skillet and cook until they begin to brown, 10-15 minutes. Once onions are cooked, stir in balsamic vinegar and continue to cook until vinegar reduces down, about 5 minutes. Stir in the chard and continue to cook until wilted, another 5 minutes or so. Preheat oven to 400˚F. While the onions are cooking, combine the eggs, cream, salt, and pepper in a bowl. Whisk well to combine. Transfer the frittata to the oven and bake for 12 to 15 minutes. The frittata should be puffed and browning. Prep ahead: Precook the quinoa and onions ahead of time. Then day-of, cook the chard and add the onions/quinoa before adding the egg mixture. When do you add the quinoa? Just updated- it goes in right before the eggs!